A bit of a request for help if I may. I’m having a bit of a trauma with my pricing at the moment and I thought who better to help me than you folk that read my blog regularly, I hope you don’t mind. I’m going to give you some pictures of my pots and I would be really interested to see what price you think I should be charging for each. Little bit of homework for you, keep you out of trouble. These are my new Oak leaf jugs, they are the middle of three sizes and are 16cm high and hold one and a half pints. My price is at the moment £31. 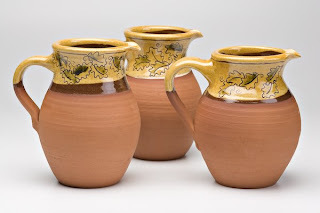 These are from my Birdie range, small, medium and large jugs. They hold half a pint, three quarters of a pint and two pints. At the moment they are £21, £28 and £36 respectively. Birdie jars, I make these in small, medium and large, 14cm, 20cm and 25cm high. They are £44, £54 and £59. Large tulip jug. These are not made in a range as the Birdie and Oak pots are. They are more one off, they all vary much more from each other. This is about three and a quarter pints and stands about 20cm tall. At the moment they are about £65 depending on the decoration. Any feedback will be gratefully received, even those of you working in dollars to whom these prices probably sound utterly terrifying. Thanks. This entry was posted in pricing. Bookmark the permalink. 6 Responses to A bit of a request for help if I may. Wow Hannah that’s a tough one for me. Everyone always tells me my prices are too low. I am interested in this though and will be watching to see what others say. It’s kinda hard coming from a dollar standpoint too.I remember the other day you said something along the lines of you’d ‘like others like myself to be able to afford my work’. I have always felt this way too but I am beginning to see it is unrealistic in some regards. It’s unfortunate because I really want my pots to go out and be used and enjoyed. I figure if someone pays a huge price they are more likely to put it on a shelf. ? A potter friend also told me she believes as we get older and hopefully more well known/collected we should be working not as hard as we were when we are/were emerging. (Still along way from this place). Her point: our prices will go up, our work will be better, more desired, we will make more money and not have to kill ourselves doing it. Just a thought.That was a bit long and didn’t even answer your question. Hi Hannah, it’s v.complex issue pricing, I am constantly surprised by how little or how much people are willing to part with for my work, having said that I & my fellow market holder usually set a ‘ball park’ figure at our market stall and test directly what the market place will pay & I have learnt a lot from Rose about talking up my work to purchasers. If you sell directly to the public or through a shop your talking wholesale to retail we generally do 100% markup + tax at retail and the shops should be able to tell you if your work is market priced or not. It is also dependant on location I live in Adelaide and if I were selling in Sydney It would be a whole different ‘ball game.’ I agree with Rons concept of value & perception and that just takes time to get your name established. After all that, your work is lovely and intricate where the piece warrants and pricing should echo that. Hi HannahPricing, what a nightmare. I’ve got to do mine tomorrow night – the very last minute because I’ve been putting it off. Perhaps I may be able to be more helpful then. It’s woth seeing what other people are selling their wares for on sites like http://www.oakwoodceramics.co.uk/Cataloguetitle.htmorhttp://www.oxfordceramics.com/That's what I’m going to be doing.I wish I could command the prices here, I think this backs up what Ron’s friend is saying.http://www.modernpots.com/index.phpGood that John Edgeler has been in touch, we’ll talk more about that soon. I like the Oxford ceramics site Doug, never seen that one before. Some of those prices are scary! I’ll have to make a decision this week so I can print my price lists. Hi, Sorry this reply is a bit late on this, last week was manic at work, but this week we are both on Holiday. Pricing is a mind field. I don’t think I have ever charged enough for my work. The basis I work on is that the price should reflect your personal feeling about each pots worth. and once you have made your decision you should be proud of the pot and the price. Last year Marion & I went to a John Leach kiln opening, and we saw one of his chap’s bring a splendid Platter out of the kiln that we were interested in, the chap took it to John for a price and he brought it back, saying john said £420. which was out of our leauge. a month ago we saw the same Platter still in the show room prices at £275. if He had said £275 on the day we probebly would have bought it.